So. 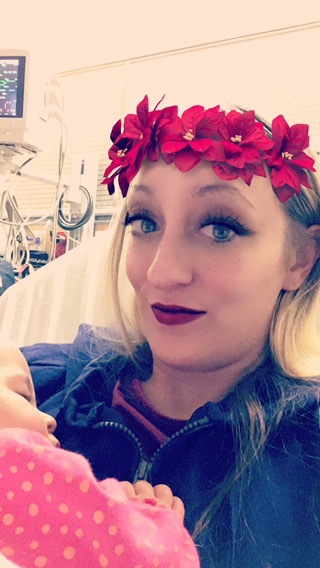 I’m in the ER with a sick baby for the very first time….and it’s pretty terrifying. With the exception of Logan’s broken arm at the end of this past summer, none of my kids had ever had an ER trip, something I was pretty proud of. If you know me at all, you know I’m not an alarmist, a germaphobe, or someone who runs to the doctor’s office over every little cough or scrape. Much less a visit to the ER. They basically have to be dying for me to go in. But after a long conversation first with the on-call nurse and then the on-call doctor, we decided to play it safe (so as to make sure she isn’t dying…) and head down to the hospital. Logan cried when I said he couldn’t come and just did not want to hear about how boring the ordeal would be for him or how I didn’t want him in the hospital exposed to crap that he didn’t need to be exposed to. So I kissed my teary eyed five-year-old good night and headed into the dark with my middle child Arielle (my older twin…by like 30 seconds…aka Sick Child…) to go to the ER and see just what it is that’s going on. 12/22/16 9:00pm – we check into Day Kimball’s ER, the local hospital in the area. Place is along the lines of that quote “though she be but little, she is fierce” cuz it’s basically a full service hospital in a tiny, rural area. You get sent to a major city for treatment if you need more than they can give you here, and like it becomes a no-joke situation. Anyway, we get checked in, smooth and easy and everyone fawns over how cute Sick Child is. And then I tell them she has a twin and I think one just dropped to the floor in awe lol. 9:15p – We get into an ER room and they take Sick Child’s temp…103.3, which is even higher than the 103.0 that made me call the pedi on-call in the first place at about 7:30. Even more troubling, this is after giving her Tylenol at 7:45ish which should have brought it right down. They tell us to hang tight, make us comfortable on the bed, and Sick Child passes out nice and hard for one of the first times all day. 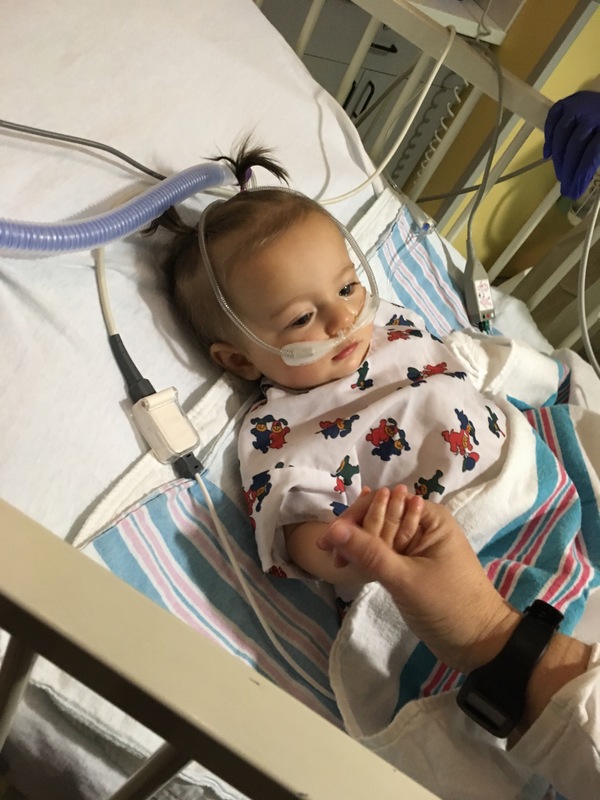 10:10p – They finally bring her some Motrin to work on that fever, which of course wakes her up and she goes back to grunting and moaning at me so that I know full well that she is not feeling well. Dr says she’ll be in to evaluate soon. 10:45p – Dr comes in (told you it would be any minute now), evaluates, and orders chest X-ray and does RSV test swab. And now we wait…. 11:10p – Chest X-ray done, featuring this contraption which looks like it’s from the mid-1800’s or so. Sick child is not pleased. 12/23, 1:00am(ish) – I’m woken by the sweetest, gentelest arm shake from the Dr at the ER. 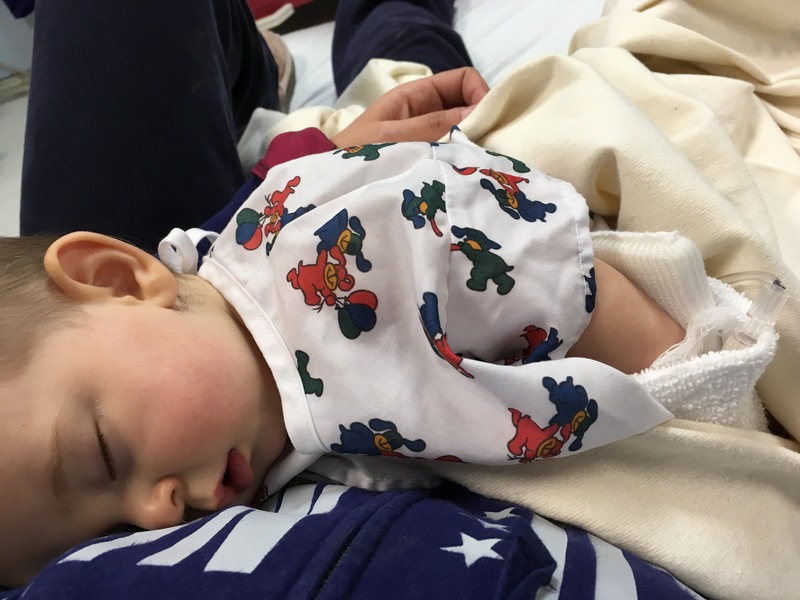 Sick Child and I had apparently both fallen asleep… X-rays negative for pneumonia, but she’s positive for RSV and her breathing is still way faster than it should be (and it’s been hours at this point). 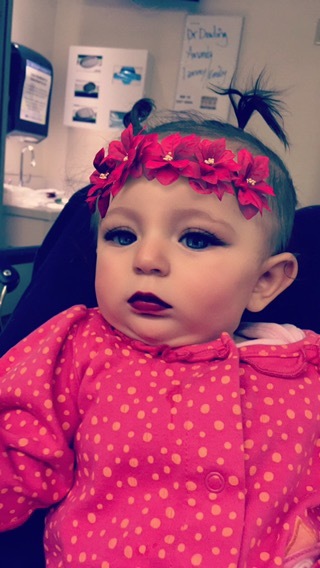 They’re transferring her to CT Children’s Medical Center so she can be admitted and observed (for at least) overnight. They say it could be 24-48 hours though….I’m seriously hoping that will not be the case. But anything at all for baby girl to feel better and be safe. Massive texting with husband and mom to figure out logistics ensues. 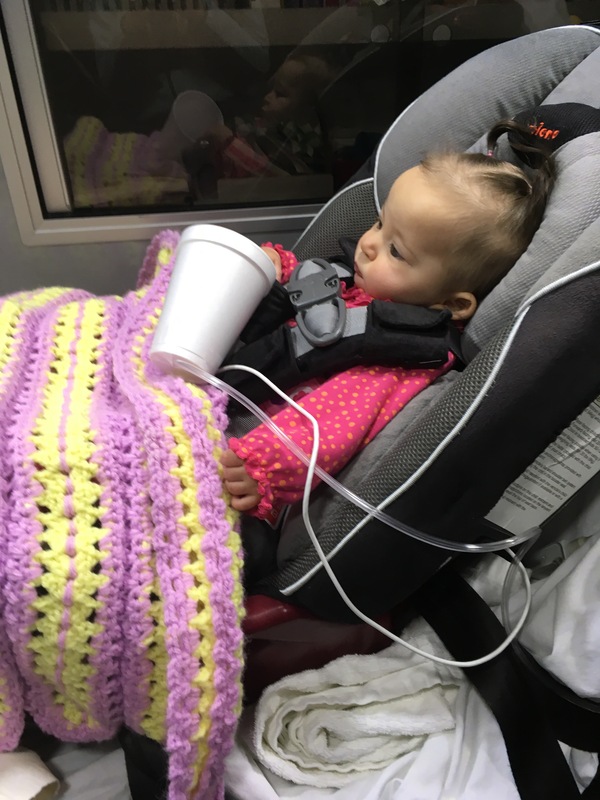 1:40am – Sick Child and I take our first ride in an ambulance together…not how I’d have chosen to try out an ambulance ride (though, really what scenario is good to try an ambulance ride anyway?) Sick Child sleeps like a baby (see what I did there lol) nearly the whole ride dispite some serious bumpiness. 3:30a – Mean nurses come in to start an IV drip on Sick Child, poke her poor little hand and create this big wrap around her arm so she doesn’t pull it out. 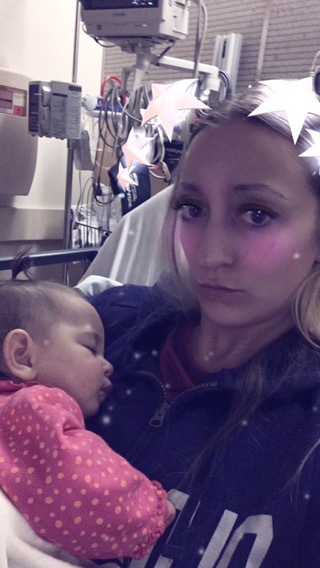 She’s so lethargic at this point that instead of wailing like I expected when stuck, she just moans at me some more and looks at me like, “make them stop mommmm…” **Disclaimer: the nurses were actually very sweet and nice and wonderful. They just put a needle in my sweet baby girl and it was no fun at all to have to watch, that’s all. 3:50a – Nurses come in to try a nebulizer/albuterol treatment on Sick Child to see if that helps the breathing at all. Dr says that it is kind of unlikely to do much, but that it doesn’t hurt and if it does work then that’s a good step in the right direction. Adorable mini dinosaur nebulizer is used, and I’m a little upset that it seems inappropriate to take a picture of its cuteness. 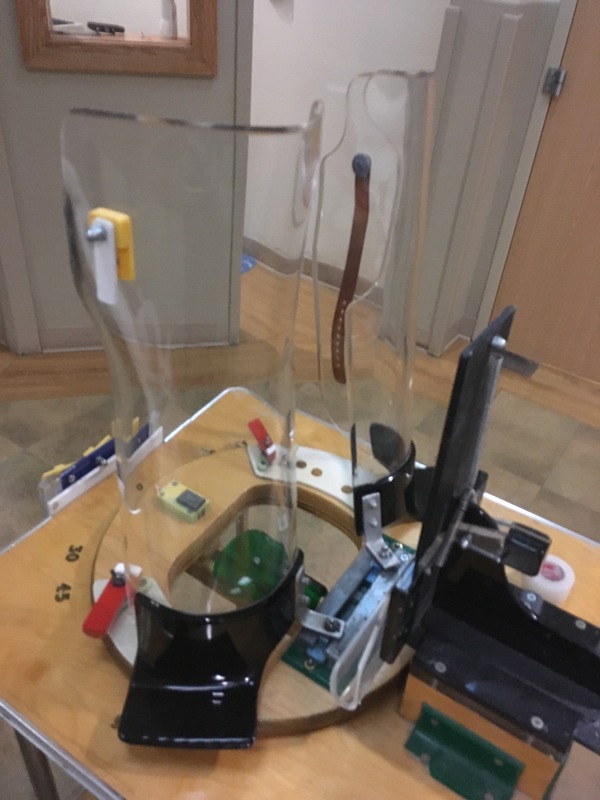 4:10a – Nebulizer, as predicted, does not do much for Sick Child and we get wheeled in to the respiratory distress room to put her on a high-flow oxygen line. They suction out her nose and throat (and lungs maybe? That tube looked pretty long…) and what appears to be half her body weight in mucus comes out and goes away in a tube to somewhere that must be infinitely disgusting. 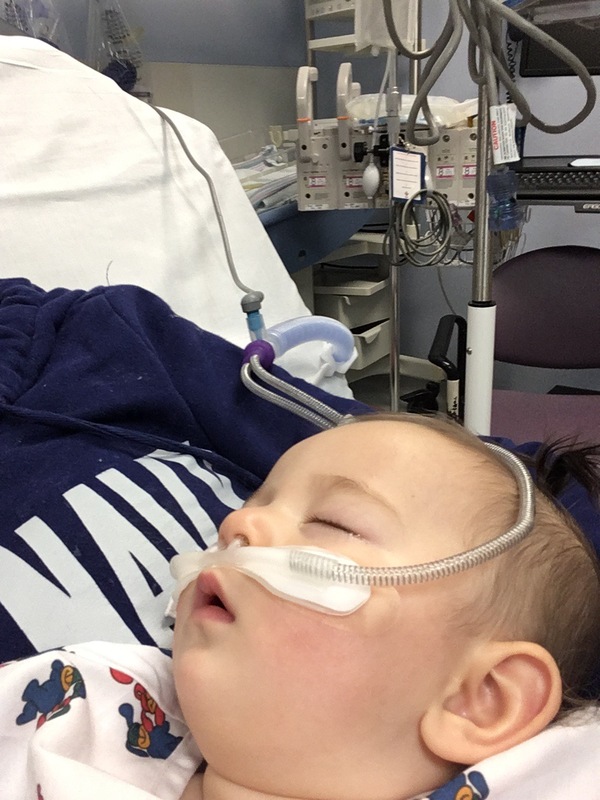 High-flow oxygen is started and Sick Child is noticably more comfortable almost immediately. 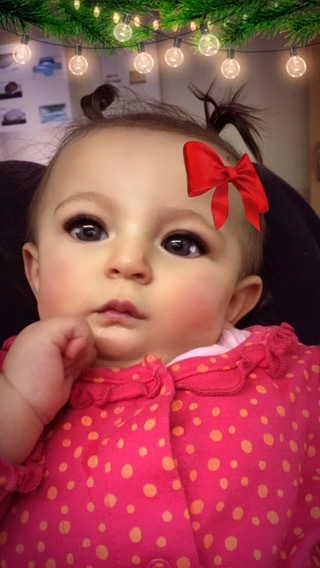 Ari’s stay would last 5 days, 4 of which were in the PICU, putting us in the hospital for the babies’ first Christmas. 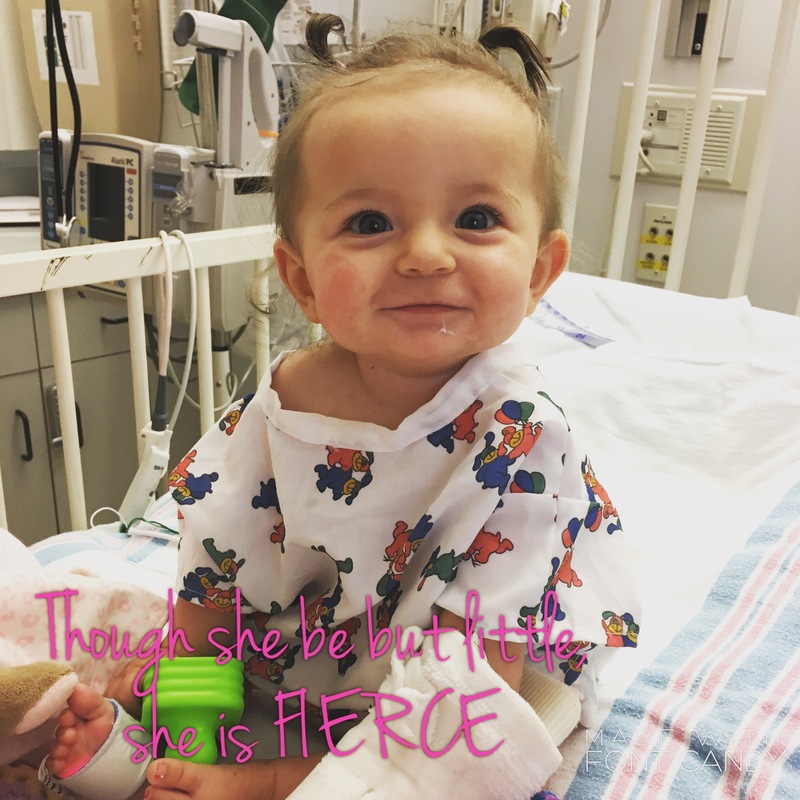 Hellish and terrifying but nothing to make you realize what you’re made of like watching your little one fighting like that in a hospital bed. This is where the crazy idea to go to nursing school truly stems from…. Next postWhen you burn a candle at both ends….and then throw a lighter right in the middle while you’re at it….